A Commentary on the Social and Religious Ferment of Mid-Nineteenth Century America (Harper & Row, 1974) 329 pages. Study of American religious history tends to focus on either pre-Jacksonian or post-Civil War developments in the field. Almost totally neglected are the 1840s and 1850s, decades which engendered the birth and development of one of the most vital American religious movements, Adventism. Eleven distinguished historians have come together in THE RISE OF ADVENTISM to reveal the period for what it was: the beginning of a blooming upsurge in American religious consciousness. The Decades were ones of almost feverish intensity. States from Wisconsin to California were being fitted into the jigsaw puzzle of a two-ocean Union. Immigration swelled over 16 times between the 1820s and the 1850s. Nativism grew from an uneasy whisper to a restless grumble. The population increased fourfold form the beginning of the century. A religious resurgence enabled many to deal with these varied and potentially traumatic forces, and its form was Adventism, the belief that the Second Coming of Christ was imminent and that America was the “beast” of the Book of Revelation. In an overarching Introduction, editor Edwin Scott Gaustad sets the scene for the rise of the movement and relates its overall concerns to each of the essays which follow. 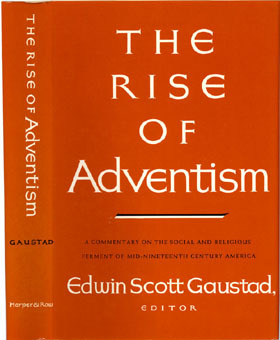 Adventism presided over and unified a number of potentially centrifugal movements in a highly energized era. They are all treated here: an overview of religious experimentations, both institutional and revolutionary; the moralism of the era’s literature and social reform; the health reform mania as it related to the religious world view; the conflict of science and religion and the response to the theories of Darwin; the communitarian experiments; and the rise of the apocalyptic Millerites. Throughout a sense is maintained not only of the influence and impact of each separate movement, but also of the tremendous vitality of the times in which it moved. Concluding the volume is an exhaustive and definitive bibliography for further reading in the Adventist movement. THE RISE OF ADVENTISM is an important contribution to the study of American religious history and shows how religious people react and cope with turbulent and troubled times. The Contributors: David T. Arthur, John B. Blake, Johathan M. Butler, John C. Greene, Robert V. Hine, Winthrop S. Hudson, Williaim G. McLoughlin, R. Laurence Moore, Ernest R. Sandeen, and Timothy L. Smith. Editor Edwin Scott Gaustad is the author of A religious History of America and other books. Only a few copies of this classic (rescued from a San Diego-area barn fire) remain from the original printing—first editions of the hardcover volume published by Harper & Row in 1974.